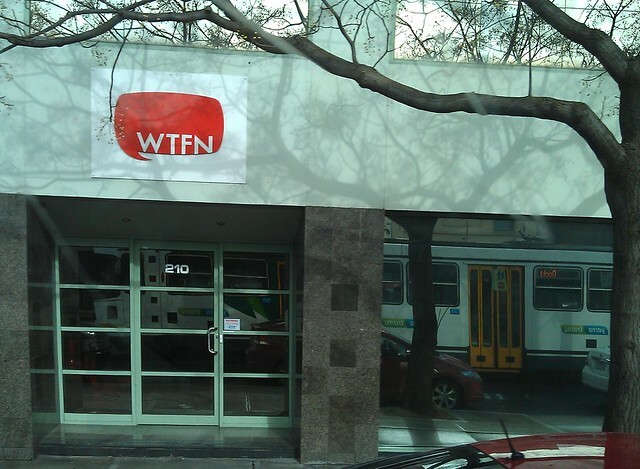 When their logo pops up on the telly at the end of some production, I often wonder what, if anything, WTFN stands for. Their offices in Hawthorn East have the logo above the entrance. Any suggestions welcome. But keep it clean. ‘What the f… now?’ was the first thing that popped into my head. I always think “what the F network”, which really makes no sense… I like yours Daniel “why the F not”. What about … Wheel Tram Forward Now! It looks like the call sign of a US based radio or TV station. These call signs almost always begin wih a “W”. Perhaps they chose these letters to make people think “WTF” or it might just be a coincedence. I have never seen this logo before and I have no Idea what sort of business this is. @Anonymous, US stations commonly start with K (west of the Mississippi) or W (east of it). I never knew that Daniel. Very interesting. I lived most of my life in the US east of the Mississippi and most of the stations I am familiar with begin with a W.
Somehow my name was lost from your site where it usually automatically appears without my noticing it and therefore my last post came up as “anonymous”. I thought they were the call sing for a local station in the US, WWFN. Which is a sports radio network. They call themselves “The Fan” , It’s a normal marketing practice to have a name that works with the Radio Call Sign. Perhaps it’s a name based on American TV station call signs, like WNBC, WABC, WFOX et al? Or maybe it’s simply the What The F*** Network. Workshop Toxic Files – non-Custard? F for Fox or Faux?